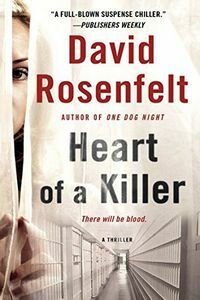 Heart of a Killer by David Rosenfelt, a Mysterious Review. Review: David Rosenfelt has written a most unusual stand-alone thriller that plays out in myriad unexpected ways in Heart of a Killer. Sheryl Harrison is a convicted killer, imprisoned for murdering her abusive husband. Several years into her sentence, her young daughter, Karen, now in the care of her mother, has been diagnosed with a heart defect. Karen's only chance for a recovery is a heart transplant; her best chance at survival is her mother's heart. Sheryl is willing to die for her daughter, but several legal barriers block her from doing so. Enter Jamie Wagner, a brilliant if unmotivated Harvard Law graduate, who takes on her case pro bono. There's no chance he'll win any of the legal arguments he presents to the court, so decides the only way Sheryl can save her daughter is to prove Sheryl is innocent of killing her husband. The only problem with this tactic: Sheryl confessed to the crime at the time of her arrest and insists to this day she did it. The legal aspect of Heart of a Killer would be enough material for any one thriller, but there's another, parallel subplot that is taking place at the same time, one of a master computer hacker, who has taken control of a nuclear power plant outside Philadelphia and ransoms it back to the US Government for $5 billion. To prove he is capable of initiating a meltdown if his demand is not met, he causes several spectacular — and fatal — accidents around the country. The combination of these two storylines is almost too much for one book. They're both interesting and exciting but the link between them seems wildly coincidental from a timing angle, making both seem just a little less believable as a result. Setting this element aside, the author deftly handles the very large cast of characters, many of which have their own perspective or point of view, in a narrative that rarely pauses, racing along at a rapid clip. Despite being a bit overwhelming at times, there is much to enjoy in this twist-filled thriller. Acknowledgment: Minotaur Books provided a copy of Heart of a Killer for this review.